MusicCast is a multi-room audio system built into many Yamaha products, including AV receivers, sound bars, wireless speakers and a turntable. Designed to work with your Wi-Fi® router, MusicCast lets you stream all of your music and other audio content to every room in your home with easy control from the MusicCast app, an Alexa device or third-party control system, such as Control4, Crestron, ELAN, RTI, or URC. True Sound. As the world's largest musical instrument manufacturer and leader in both professional and home audio solutions, Yamaha is as passionate about sound quality as you are. This passion is reflected throughout our product line – from sound performance of individual products to the underlying technologies, such as high-resolution audio streaming, supported by MusicCast. Choice. The MusicCast family includes a broader variety of product types at different performance levels and price points than other multi-room audio systems. MusicCast-enabled devices aren't limited to wireless speakers and sound bars. You'll also find AV receivers, stereo receivers, streaming amplifiers, multi-room streaming amplifiers, a subwoofer and a turntable in the MusicCast family. There are over 60 devices in all, giving you a larger selection of listening experiences to choose from when filling your home with sound. Flexibility. MusicCast products support not only Wi-Fi, but also other wireless technologies like Bluetooth®, Spotify Connect and AirPlay®. Devices can also be wired to Ethernet. Plus, many MusicCast models offer HDMI®, optical, analog and/or phono inputs that can be selected as a source for listening throughout your home. Wired or wireless, streaming or traditional content, home theater or whole home audio — MusicCast supports it all. Where can I find a list of models that are compatible with MusicCast? Which MusicCast models are compatible with MusicCast Surround and/or MusicCast Stereo? Select MusicCast models can be configured to work together in wireless multi-speaker configurations within a single room. MusicCast Surround allows compatible MusicCast speakers to be used as wireless surrounds for a 5.1-ch. or 5.1.2-ch. home theater system when used with a compatible AV receiver or sound bar. MusicCast Stereo allows for stereo or 2.1-ch. configurations using compatible MusicCast speakers. See a list of compatible models. Yamaha was one of the first AV manufacturers to introduce a wireless multi-room audio system, similarly named MusicCAST, back in 2003. This was followed by MusicCAST2 in 2009, and then MusicCast in August 2015. Models released from August 2015 to present are compatible with one another. Select newer models also support MusicCast Surround/Stereo which are only compatible with other models that also support MusicCast Surround/Stereo. Check a model's compatibility here. MusicCast Surround was introduced in April 2018. It allows select AV receivers and the MusicCast BAR 400 sound bar to use select MusicCast speakers as wireless surround sound speakers. This can be configured in the MusicCast app. The MusicCast Surround capability is ideal for situations where it's a hassle or not possible to run wire from the front of the room to the back of the room for rear speakers. If your model is not compatible with MusicCast Surround, remember that MusicCast products in general support a wide variety of surround sound experiences. For those who want the ultimate home theater, MusicCast AV receivers support many multi-channel configurations and technologies, including Dolby Atmos® and DTS:X™, depending on the model. For those looking for a simple installation, select MusicCast sound bars use Yamaha digital sound projector (DSP) technology to deliver true 5.1-ch. or even Dolby Atmos/DTS:X surround sound without the need for wiring surround sound speakers. MusicCast Stereo was introduced in April 2018. It allows select MusicCast speakers to be configured for stereo or 2.1-ch. stereo setups using the MusicCast app. Depending on the speaker model, this can be accomplished with one or two speakers, and, if desired, the MusicCast SUB 100 subwoofer. MusicCast Stereo setups are configured using the MusicCast app. See how to pair older MusicCast speakers. Watch a video on how to pair older speakers. The MusicCast app makes it easy to add a MusicCast device to the system. From the Settings menu, select "Add New Device", then follow the simple steps, which include pressing and holding the device's "CONNECT" button for a few seconds. Streaming services vary by country and model. In the United States, Spotify, Pandora, SiriusXM Internet Radio, SiriusXM Music for Business, Qobuz, Deezer, TIDAL, Napster and free internet radio can be accessed from the MusicCast app on most current MusicCast devices. Apple Music can be accessed using AirPlay. For a list of streaming service availability for your MusicCast product, see here. Using Bluetooth, MusicCast supports content from any streaming service available from your smartphone or tablet. Does MusicCast support playback of Qobuz high-resolution audio? 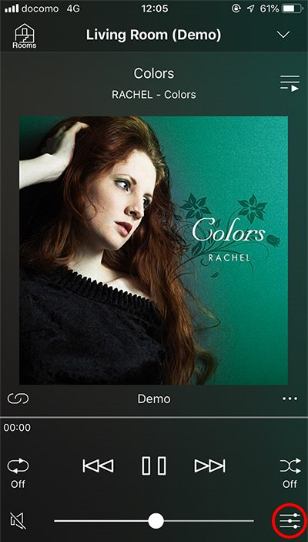 Yes, all MusicCast devices support playback of high-resolution audio up to 192 kHz / 24 bit. Select MusicCast products support AirPlay 2®. See here for a list of AirPlay® and AirPlay 2® compatible products. Yes. All MusicCast devices support Bluetooth except the XDA-QS5400RK. A Bluetooth input source can be used with multiple linked MusicCast devices, so music can be played in multiple rooms simultaneously. The MusicCast app provides basic volume, play/pause and track skip control of Bluetooth input devices during playback. Most MusicCast devices support Bluetooth transmission as an output steam to a Bluetooth-enable speaker or headphones. Bluetooth devices must be SCMS-T / A2DP profile compatible. Note that if you are using Bluetooth as an input, you will not be able to transmit content at the same time. Set the Bluetooth connection for the Bluetooth device (wireless headphones, etc.) to pairing status. Tap the mark circled red in the playback display of "MusicCast CONTROLLER"
Select the Bluetooth device (wireless headphones, etc.). For MusicCast Surround/Stereo configurations, which combine multiple devices into a single "room" within the app, each device counts against the total only for the Master room. Client rooms (linked to the Master) are counted as one device even if they are composed of multiple devices in a MusicCast Surround/Stereo configuration. Alexa is Amazon's cloud-based voice service. You can talk to Alexa to play music, hear the news, check weather, control smart home devices and more. Alexa is built into many Amazon products, including all of its Echo devices, Fire TV devices and Alexa-enabled devices from other companies. To get started with Alexa on MusicCast, you'll need to have your Echo and MusicCast products installed with Wi-Fi® access and both the Alexa app and MusicCast app need to be loaded on your smart device. At this time, the skills support English and German. Availability of voice command control via Amazon Alexa varies by region. Yes, all MusicCast products can be controlled with Google Assistant using "MusicCast Actions." Part of Actions on Google, MusicCast Actions are a set of custom voice commands that can be enabled through the MusicCast app. All Google Home products with a microphone should be able to voice-control MusicCast products. This includes Google Home, Google Home Mini, Google Home Max, Google Home Hub, or your Android phone – as well as on many devices from other companies. Ok Google, ask MusicCast to turn on the [Room Name]. Ok Google, ask MusicCast to turn off the [Room Name]. Ok Google, ask MusicCast to turn off all rooms. Ok Google, ask MusicCast to play in the [Room Name]. Ok Google, ask MusicCast to pause in the [Room Name]. Ok Google, ask MusicCast to stop in the [Room Name]. Ok Google, ask MusicCast to stop all rooms. Ok Google, ask MusicCast to play [Favorite x] in the [Room Name]. Ok Google, ask MusicCast to play [Playlist x] in the [Room Name]. Ok Google, ask MusicCast to play Recents in the [Room Name]. Ok Google, ask MusicCast to set volume to  in the [Room Name]. Ok Google, ask MusicCast to set group volume to  in the [Room Name]. Ok Google, ask MusicCast to turn up the volume in the [Room Name]. Ok Google, ask MusicCast to turn down the volume in the [Room Name]. Ok Google, ask MusicCast to turn up the group volume in the [Room Name]. Ok Google, ask MusicCast to turn down the group volume in the [Room Name]. Ok Google, ask MusicCast to mute the [Room Name]. Ok Google, ask MusicCast to unmute the [Room Name]. Ok Google, ask MusicCast to mute all rooms. Ok Google, ask MusicCast to skip song in the [Room Name]. Ok Google, ask MusicCast to play previous song in the [Room Name]. Ok Google, ask MusicCast to play this again in the [Room Name]. Ok Google, ask MusicCast to shuffle all songs in the [Room Name]. Ok Google, ask MusicCast to turn shuffle off in the [Room Name]. Ok Google, ask MusicCast to repeat one song in the [Room Name]. Ok Google, ask MusicCast to repeat all songs in the [Room Name]. Ok Google, ask MusicCast to turn off repeat in the [Room Name]. Ok Google, ask MusicCast to switch input to [HDMI1] in the [Room Name]. Ok Google, ask MusicCast to link the [Room Name] with the [Room Name]. Ok Google, ask MusicCast to unlink the [Room Name]. Ok Google, ask MusicCast to link the [Room Name] with all rooms. Ok Google, ask MusicCast to unlink all rooms. Ok Google, ask MusicCast to set sleep timer for [30, 60, 90, 120] minutes in the [Room Name]. Ok Google, ask MusicCast to cancel the sleep timer in the [Room Name]. Ok Google, ask MusicCast what's playing in the [Room Name]. Ok Google, ask MusicCast to play the piano. Ok Google, ask MusicCast to stop the piano. Ok Google, ask MusicCast to skip the piano. Ok Google, ask MusicCast to play previous song on the piano. Ok Google, ask MusicCast to play [song name] on the piano. Ok Google, ask MusicCast to play the piano in Acoustic mode. Ok Google, ask MusicCast to play the piano in Quiet mode. Ok Google, ask MusicCast to turn up the volume on the piano. Ok Google, ask MusicCast to turn down the volume on the piano. Ok Google, ask MusicCast to turn on the piano. Ok Google, ask MusicCast to turn off the piano. Ok Google, ask MusicCast for my user id. Ok Google, ask MusicCast to tell me all rooms.